A twisted killer has a deadly riddle for DI Maya Rahman to solve in this pulse-racing thriller, the first in an addictive new series set in East London. A headmistress is found strangled in her East London school, her death the result of a brutal and ritualistic act of violence. Found at the scene is a single piece of card, written upon which is an ancient Buddhist precept: "I shall abstain from taking the ungiven". At first, DI Maya Rahman can’t help but hope this is a tragic but isolated murder. Then, the second body is found. Faced with a community steeped in secrets and prejudice, and with a serial killer on her hands, Maya must untangle the cryptic messages left at the crime scenes to solve the deadly riddle behind the murders – before the killer takes another victim. Trying a new crime writer, especially a debutant, is always an adventure. 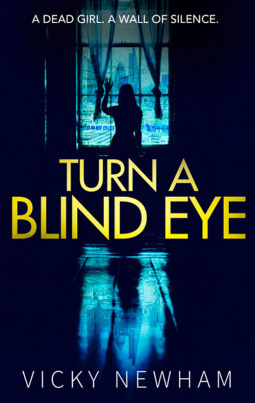 I was excited about reading TURN A BLIND EYE after hearing a fair bit about Newham's first novel online in recent months. Would I find a promising author, an accomplished tale, or something that needed more seasoning? Overall, I really enjoyed TURN A BLIND EYE. It has a very contemporary, current feel, delving into some challenging social issues with a good sense of its London setting and introducing an interesting main character who I could definitely see being the spine of an ongoing series. DI Maya Rahman is a Bangladeshi-British cop who has recently from her ancestral homeland, having had to deal with a deep personal tragedy. As she settles back into East London life, a murder strikes close to home: the headmistress of Maya's old high school is found strangled, on the school grounds. It's a crime that shocks the community, causing lots of ripples and raising lots of questions. Maya has to deal with vulturous reporters, stunned teachers, and untrusting students and families. Suspicion swirls, as do rumours. The investigation pulls at many veneers, exposing secrets that may or may not have anything to do with the crime. At the same time Maya is having to deal with a new colleague that's been foisted upon her from overseas, and a boss who causes more problems than solutions. There's an awful lot to like about Newham's debut. It flows really well - the kind of book where you think 'I'll read one more chapter' but are still reading 100 pages later. There's kind of an addictive, x-factor quality to the writing that you can't easily deconstruct or explain. Told in a straightforward manner that still has some elegance, it powers forward. Highly absorbing, more than rip-roaring. Newham excels with her descriptions of her debut's culturally diverse London setting. TURN A BLIND EYE is deeply set among the children-of-immigrant communities of East London, where cultural clashes and misunderstandings loom, just out of sight, before flashing into life. It's a minefield for Maya and her colleagues to navigate, of different beliefs, values, and sensitivities. They're hampered by mixed relationships between the community and the police. There's a real sense of currency and authenticity to the way Newham textures her tale with its setting, bringing it to life. The plotting was good, well-woven overall, and the character of DI Maya Rahman and her police colleagues fitted the tale perfectly, while showing plenty of promise for an ongoing series. We learn a fair bit about Maya, while still getting the sense that there's much more to learn. She's had and has a complicated family and personal life, without being a cliched alcoholic/divorced/troubled detective. There's a freshness to the character, some sense of difference without just being different for the sake of it. There's a good sense of 'realness' to the characters as much as the setting. Overall a good read that's a very adroit debut. Vicky Newham is a writer to watch, and I look forward to seeing how she and DI Maya Rahman grow as the series continues.